Other than their fishing reel, if you asked any experienced fishermen “what’s the one piece of gear that they can’t leave the house without is”, most will tell you their sunglasses. That’s because when it comes to sight fishing, anglers know that in order to catch the fish, you first have to see the fish. This is why a good pair of sunglasses is super important! However, with so many brands and colors available on the market, many don’t know which ones to choose. It’s for this reason that I decided to do a little research and find out once and for all what colors and brands are the best when it comes to the best polarized sunglasses for sight fishing. Through my research and testing, I decided that Costa’s Tuna Alley was the best when it comes to high-end fishing sunglasses. However, the Peahi sunglasses by Maui Jim were not too far behind when it came to clarity and quality. Make sure to check out our complete list of sunglasses, along with each of their individual reviews and decide for yourself which ones are the best. Also, to further help you in your buying decision, I’ve also included a detailed buying guide on what to look for in a good pair of sunglasses. Sliding into the top spot on our list are the Costa Tuna Alley sunglasses. While extremely capable for all your fishing needs, the Tuna Alleys are also super stylish. They come in a variety of colors and are available in both glass and plastic lenses. Typical with any pair of Costas that you buy, quality will not be a concern! Like all Costa sunglasses, the Tuna Alleys are handmade at Costa’s headquarters in Daytona Beach, Florida. They are constructed from a super tough and durable bio-based nylon frame material that can really take a beating. However, the one thing that really separates these and other Costa sunglasses apart from the rest is their patented 580 lens. Developed by light-spectrum experts, this technology goes beyond your typical polarized sunglass lens. They not only block harmful UV light by up to 100% but also absorb HEV light which has been linked to causing macular degeneration as well as cataracts and other eye diseases. I think we can all agree, that when it’s all said and done, the most important aspect of polarized sunglasses should be to protect your eyes. With that being said, it’s also important that your sunglasses help you see the fish that you are trying to catch. This is why the 580 developers designed the lens to block out harsh yellow light, enhancing the reds, greens, and blues to shine through. This means that you will be able to see what’s under the water much more clearly. The only negative thing that I have to say about Costa Del Mar sunglasses is that while they are well worth it, they are expensive. I guess you get what you pay for though! Handmade in the USA, Costa sunglasses are the standard that every other pair of sunglasses are judged by and for good reason. Their limited lifetime warranty and excellent customer service demonstrate how serious they are about their product. Although they didn’t get our top nod for “best-polarized sunglasses for fishing”, Maui Jim sunglasses are still widely considered to be one of the best sunglass brands for fishermen on the market today. In fact, a lot of people prefer them over Costas. Whether fishing, scanning the waves on the beach, or just kicked back by the pool, the Maui Jim Peahi have got you covered. Like Costa Del Mar’s 580 lenses, Maui Jim has it’s own patented lens technology. Their PolarizedPlus2 glass lenses offer superior clarity and at the same time, shields your eyes from 99.9% of the harmful UV and HEV rays that the sun emits. Maui Jim has also earned the Skin Cancer Foundation’s Seal of Recommendation as an effective UV filter for your eyes and surrounding skin. Claiming to be up to 32% thinner and lighter than standard lenses, the Maui Jims provide unparalleled clarity and are scratch resistant. They offer four different lens colors, including gray, bronze, Maui Rose. They also offer the Maui HT lens color. When other lenses are too dark, this “high transmission” lens provides extra contrast and color, making a perfect choice for low-light conditions. The frames of the Peahi are just as reliable as the lenses are, making for a complete pair of fishing sunglasses. The prescription ready, hypoallergenic cellulose-based frames are lightweight, saltwater approved, and are made to fit a variety of head shapes and sizes. The one thing that I don’t like about the Maui Jim brand is that they only offer a 2-year warranty on all their sunglasses. This is one area where it makes more sense to buy a pair of Costas. Also, there have been reports that the “matte black” frame’s paint has been susceptible to peeling over time. Maui Jim has an extremely loyal following, which says something about the quality of the brand. Overall, the Maui Jim Peahi sunglasses are a great choice for fishermen who don’t mind spending a little extra for a good quality pair of sunglasses. 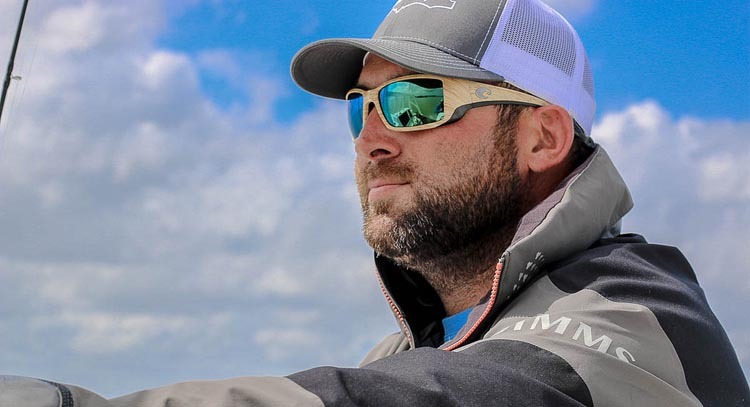 If you’re looking for a great pair of fishing sunglasses for under $100, then look no further than the Smith Dockside sunglasses. These sunglasses are built to withstand anything! Their Grilamid TR90 is an extremely lightweight, flexible plastic that will maintain it’s shape under all temperatures. The easiest way to explain how tough these things are is that once you put them on your head, you know that you are wearing them. However, their light enough that eventually you’ll forget that you even have them on. Oh, and you won’t get a headache from extended wear either. As with the other sunglasses on our list, Smith has its own patented lens technology and claim that it’s the best. The way that their Chromapop technology works is that it filters two specific wavelengths of light that cause color confusion. This allows the lens to deliver greater definition and natural color, providing unmatched clarity and detail. Lucky for you that the Smith Docksides are equipped with Smith’s Chromapop+ lenses. Made from the clearest, lightest, impact-resistant polymer on the market, this super durable lens deliver more clarity than the standard Chromapop lens and up to 10% lighter than your standard lens. One thing that separates the Docksides from the other sunglasses on our list is the hydroleophobic coating on the lenses. This stuff will repel water, oil, and grime just like Rain X does for your car windows. Another component of the Chromapop technology is its tapered lens technology. This unique design corrects distortion by progressively tapering the lens from the center to the outside edges of the lenses. This enables light waves to be delivered straight to your eye, resulting in zero distortion. One negative about the Smith Dockside sunglasses is the nose piece. It’s been reported to be a little wide and has a tendency to fall off noses. These sunglasses are also on the larger side, so may not be the best choice for people with smaller heads. Overall, the Smith Dockside sunglasses are a great option if you don’t want to shell out hundreds of dollars on a pair of more expensive sunglasses. They also come with a limited lifetime warranty. Selling for less than $50, the Suncloud Pursuits are a great option if you’re on a budget. Made from the same Grilamid nylon plastic as some of you’re more expensive sunglasses, the Suncloud Pursuits are indeed stronger and much more durable than the average $50 pair of sunglasses. The Pursuit’s lenses are made from high quality, optical grade polycarbonate plastic, with a high-grade polarizing film that’s incorporated into the lens. The super lightweight lens is able to withstand high impact situations and is also UV resistant. One thing that really surprised me about the Suncloud Pursuits is that they come with a limited lifetime warranty. Maui Jim doesn’t even offer this kind of guarantee! Flying fisherman was actually the first pair of polarized sunglasses that I ever owned and 10 years later, they are still going strong. Available in multiple colors and styles, Flying Fisherman is sure to have a pair of sunglasses that fit your head and your needs. Their custom polarized RhinoLenses are made out of polycarbonate and are lightweight, scratch resistant, and shatterproof. The Flying Fisherman AcuTint lens coloring system helps to add color contrast, while not distorting your surrounding colors, allowing you to see your environment in the clearest most natural form. The lenses also provide 100% protection from the sun’s harmful UV and UVB rays. The biggest turnoff about these sunglasses is that they only come with a one year warranty. However, as I said before, I’ve had my pair for 10 years without any problems. Any fisherman worth his salt knows the importance of a quality pair of sunglasses! Not only do they help you stalk your prey more effectively by allowing you to see them under the water, but they also help to protect your eyes from the sun, which when all is said and done, is the most important thing. One of the most important things to consider when deciding on your fishing sunglasses is their lens color. Do you go with a blue, amber, or gray color? Should you opt for a mirrored or non-mirrored lens? Is there a lens color that works best in all conditions? While there are many different exterior lens colors on the market today, there are two main colors when looking through your lenses. Gray/smoke and copper. The mirrored exterior of the lens, while important for preventing the suns glare from entering into your eyes, is mainly just for show. Most gray/smoke lenses will have a blue mirrored exterior. These lenses work best for fishing on bright sunny days, as they only allow about 10% to enter your viewing area. This makes them the go-to sunglasses for offshore fishermen, fishing in deep water. Copper lenses, which routinely come with a green mirrored exterior lens work best in low light conditions and murkier water, making them perfect for inshore fishermen. By allowing 10-12% of light to enter, they are the most versatile of the two colors. You can also include vermilion, rose, and amber lens colors in this category. If possible, you want to match your lens color with the type of conditions that you’ll be fishing in, including the color of the water. 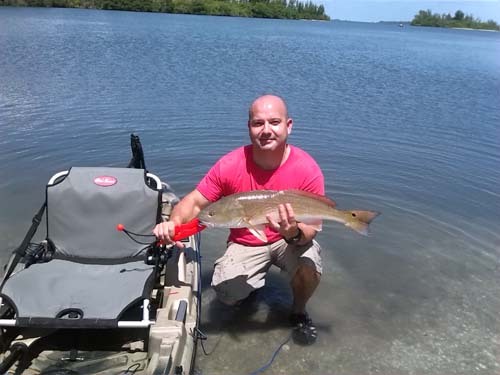 While you can’t control how much sunlight mother nature will provide you, you should know if you’ll be fishing twenty miles offshore in blue water, or sight fishing for reds on the Mosquito Lagoon in Florida. If you are a fisherman who ventures offshore, but who also loves to target inshore species of fish from time to time, I recommend buying two pairs of sunglasses. One with a gray based lens color and the other with a copper-based lens color. I will be honest with you! I prefer glass lenses over the plastic polycarbonate lenses. I personally feel that they provide a much clearer viewing experience and don’t scratch nearly as easy as plastic lenses do. With that being said, glass lenses are much more expensive than their plastic counterparts. Not only that, but they will crack like an egg if you drop them. I found this out the “hard way”(pun intended) when I dropped my brand new pair of Costa’s on the floor of the Bass Pro Shop while trying on a new hat. I literally got sick to my stomach when I saw the lens had shattered in ten different directions. There’s nothing worse than paying $200 dollars for a pair of sunglasses, only to have to shell out another hundred to get them fixed. Glass lenses are the best, but you have to be extra careful with them. The most common lens material used for sunglasses is polycarbonate. It’s a type of plastic that’s super strong and pretty good at resisting scratches. For me, the best thing about sunglasses made with this material is the price. They are much less expensive than glass lenses, not to mention less likely to crack when dropped. As far as their clarity, I don’t feel that they provide as clear of viewing experience as glass lenses do, but is it that much of a difference in justifying spending an extra hundred bucks for glass lenses? In my opinion, yes, but you’ll need to decide on that one for yourself. I will say that if you are on a budget, prone to accidents, or just don’t want to deal with the stress of possibly breaking your lenses, I would highly recommend you think about buying a pair of polarized sunglasses with polycarbonate lenses. Probably more important than the lens color of your sunglasses is the frame shape. After all, you could be wearing these things for hours and believe me, a poorly fit pair of sunglasses can make for a long day, not to mention give you a pounding headache. The best polarized sunglasses for fishing should match the shape of your face and be comfortable enough for spending the day on the water. Contrary to what some sunglass manufacturers would have you believe, there is not one size fits all when it comes to frame styles. For instance, sunglasses for oval faces are not going to fit people with small faces. And people with big heads like myself are not going to fit their melons into a pair of sunglasses intended for small faces. While you can usually get a better deal if you buy your sunglasses online, I would highly recommend that you first go to your local sunglass store/sporting goods store and try on all the styles that you are interested in. Just like with colors, there are tons of different frame styles for sunglasses on the market today. Two of the most popular for fishing are the aviator and sports styles. While aviator sunglasses can be extremely comfortable and stylish, they are much more likely to break than a good pair of plastic framed sunglasses. Their slender metal construction opens them up to a number of potential casualties, including dropping them and sitting on them. They also have more moving parts, which could lead to lost screws, broken hinges, loose nose guards and so on. In my opinion, a good pair of sunglasses for fishing are made with a solid plastic body, virtually eliminating the chance of them breaking. A lot of them also come in a wrap-around style, which also aids in blocking out the sun’s glare from your peripheral vision. As far as the cost, they are about the same. Do I really need to buy a $200 pair of sunglasses or will the $20 pair of Shakespeare Ugly Stik Spartans that you can pick up at your local Walmart work just as good? That’s a question you and countless others have asked themselves, including me. When it comes to expensive and cheap sunglasses, the biggest difference is how they will hold up over time. Out of the box, the less expensive sunglasses will work just as good as the more expensive versions, however, time will take its toll on them and they will quickly deteriorate. While a pair of Costas or Maui Jims could potentially last a lifetime, the cheaper shades usually won’t make it past their first year if you’re lucky. If you only get a chance to go fishing once in a great while, there’s really no need in buying an expensive pair of polarized sunglasses. The cheap pair from Walmart will do just fine. However, if you’re fortunate enough to get out on the water more often and are a little more serious about catching some fish, I highly recommend that you spring for the best polarized sunglasses that you can afford. They will more than pay for themselves in the long run! Now that you have five great choices to choose from, selecting a great pair of polarized sunglasses should be a little easier. Remember that the best sunglasses for fishing are not necessarily the most expensive, but rather the pair that fits your face, your budget, and protects your eyes from the harsh rays of the sun. Being able to see the fish is just an added benefit!